Praise: I am thankful that my new dishwasher and garbage disposal will be delivered and installed tomorrow. Our dishwasher stopped cleaning dishes about three months ago. A month ago, our garbage disposal started leaking out the bottom into the cupboard under the sink. Last week, I finally had the time to go look for replacements. I had a list of what I felt were necessary features and what were wishes. I was just about to walk out of the final store when an employee stopped me, asked me a few questions, and then showed me a returned machine that had all of my necessaries AND wishes. The reason why it was returned: wrong color. Wrong color for the original recipient, but the color that I wanted. Long story short, I was able to get all of the wishes, delivery, installation and haul away for less than what I would have paid for a lesser model. God was very kind to meet above and beyond what I expected. Ponderings: Auburn had a rough day. When she came home from VBS, she checked on her fire bellied toad, only to find Libby dead. 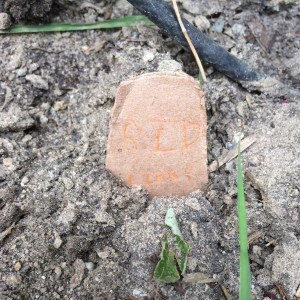 🙁 We had a little burial service. Auburn has handled it pretty well. I was afraid we would have many meltdowns tonight, but after the initial emotion, she hasn’t cried again. She has checked on the burial site a few times, but she is remaining strong.